M.J. the “King of Pop” was recognized as the most successful entertainer of all time by Guinness World Records. His contributions to music, dance, and fashion, along with his publicized personal life, made him a global figure in popular culture for over four decades. 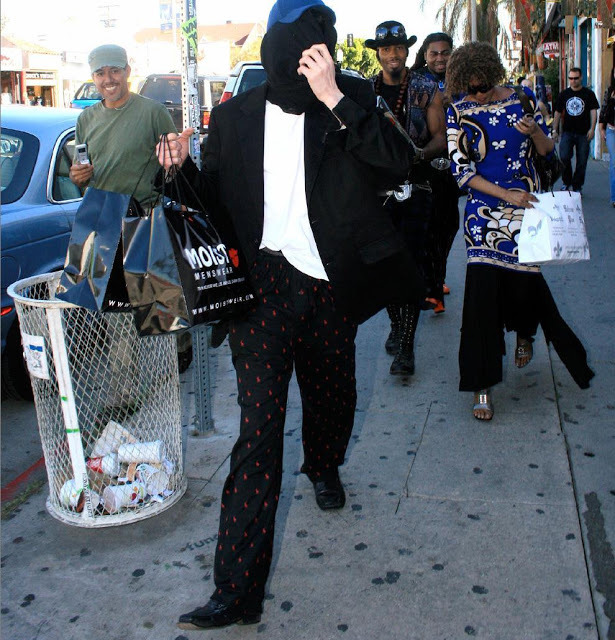 As you can see in an effort to shop in peace, Michael Jackson wearing a black hood, a blue baseball cap, black blazer and pajama-type trousers asked the us of the clothing store Moist Wear to close the shop and lock out fans and curious passers-by who had gathered to catch a glimpse of the pop star. One fan managed to speak with Michael Jackson and get his autograph before the pop superstar went into his limo. He says,“He seemed very nervous and begged me not to tell anyone he was there. He said, `Don’t tell anyone…’ over and over. “I shook his hand and I could tell that he was shaking a little. He tried to cover up his face but I could see the bandages on his nose. He looked nothing like the guy on the latest cover of Ebony magazine, where he looked good. The unnamed fan also reveals it was only when he heard Michael Jackson speak that he knew who he was. He adds, “I had an inkling as I walked by him; he was just propped up by a wall outside one of the stores – he just looked like a homeless guy. But then it clicked! 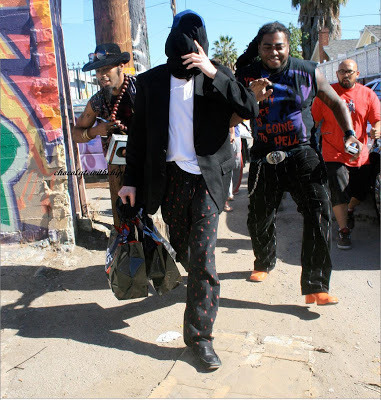 As Jackson and his bodyguards left Moist Wear with three new shirts, he was swarmed by fans who followed him through to his getwaycar. And, just when Jackson felt his low-key shopping trip couldn’t get any worse, his associate realized she’d picked up a parking ticket on her windshield. Ironically, among the unsuspecting shoppers who passed Michael on Melrose was Desperate Housewives star Eva Longoria.